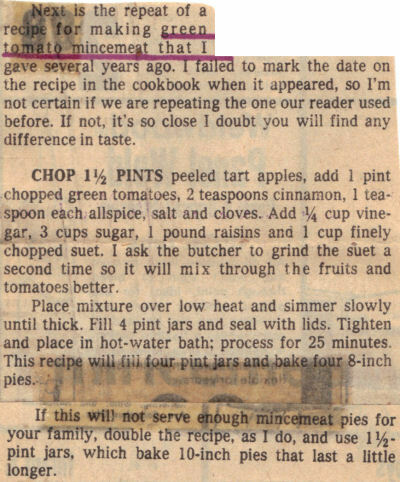 Here are two very similar clippings from a newspaper for green tomato mincemeat that I found in a large collection, dates unknown but I believe they span a few years apart and are from the same author. I’ve typed them below along with a scanned copy of each. Once you have eaten a pie baked with green tomato mincemeat, you will agree you cannot tell the difference from the real mincemeat and it is much more economical. This recipe makes four pints, enough for four small pies or two nine-inch pies. If you want to make more, we suggest you double the recipe and can or freeze it, then make the second double recipe if your family likes mince pie that well. Chop one and one-half pints of tart apples; chop one pint of green tomatoes; cut and remove seeds before chopping. Measure three cups of sugar into mixing bowl. Add one pound of raisins, add one-fourth cup of vinegar and one cup of chopped suet. Have the butcher grind it fine. Add one teaspoon each of salt, allspice and cloves. Place over heat and simmer until mixture is thick. Fill jars, seal, process in hot water bath for 25 minutes. This should fill four pint jars. To freeze, allow mince meat to cool, then fill plastic containers and freeze. Next is the repeat of a recipe for making green tomato mincemeat that I gave several years ago. I failed to mark the date on the recipe in the cookbook when it appeared, so I’m not certain if we are repeating the one our reader used before. If not, it’s so close I doubt you will find any difference in taste. CHOP 1 1/2 PINTS peeled tart apples, add 1 pint chopped green tomatoes, 2 teaspoons cinnamon, 1 teaspoon each allspice, salt and cloves. Add 1/4 cup vinegar, 3 cups sugar, 1 pound raisins and 1 cup finely chopped suet. I ask the butcher to grind the suet a second time so it will mix through the fruits and tomatoes better. Place mixture over low heat and simmer slowly until thick. Fill 4 pint jars and seal with lids. Tighten and place in hot-water bath; process for 25 minutes. This recipe will fill four pint jars and bake four 8-inch pies. 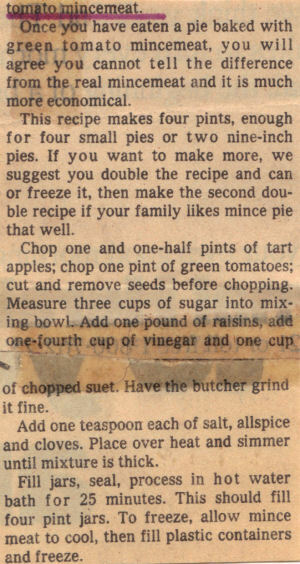 If this will not serve enough mincemeat pies for your family, double the recipe, as I do, and use 1 1/2-pint jars, which bake 10-inch pies that last a little longer. If planning on canning this recipe, please read this page, the “Safe Canning & Food Preservation” section.